At the Top of Squirrel Spur: What to Do On a Cloudy, Cool Day? What to Do On a Cloudy, Cool Day? Here I sit, with lowering clouds and an empty shop, enjoying the soft light and crocheting while I listen to music from the Crooked Road. This blanket is for the grandchild of a friend, coming along soon so I've been working steadily on it. 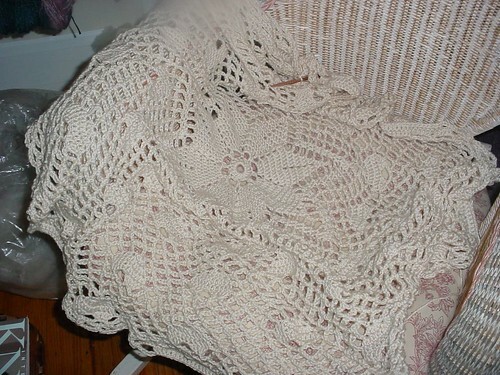 The pattern is adapted from a doily by Cylinda Matthews; it has been fun working with it! And the latest spinning I've done, which isn't all that recently. Fiber Femmes July/August issue was late, late, late; so much has been happening. So I've spent most of the last couple of weeks concentrating on that and letting the spinning wheel sit idle. 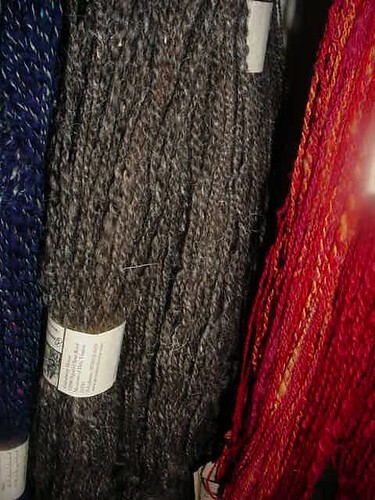 But I'll soon be working on my next yarn; perhaps a blend of angora and merino in pure, pure white.